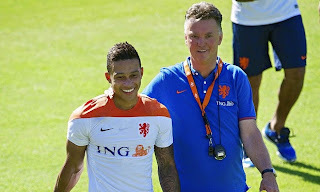 Louis van Gaal has revealed Manchester United were forced to move for Memphis Depay earlier than planned out of fears that he would sign for Paris Saint-Germain. On Thursday it was announced that United and PSV Eindhoven had reached an agreement for Depay, with the Dutchman set to complete his transfer in June subject to a medical. Van Gaal had wanted to wait until the summer before signing the 21-year-old, but he had to complete the deal early because of PSG’s interest in the player. “I was forced to handle (the situation) as a manager because, otherwise, he was going to PSG, that’s why I had to sign him and we’ve done it within one day. But, for us, it’s better to focus on the game against Palace,” Van Gaal told MUTV. The manager is keen to finalise his transfer business as early as possible, but he will wait until the summer to ensure his team remain focused on securing a top four finish. “I want to do this early but it’s not always possible,” he added. “When there’s a chance, to you have handle that and manage it directly and that was the case. I want to purchase players after our season and not during the season because it disturbs our concentration for the match,” he stressed. Depay impressed Van Gaal during the Netherlands’ World Cup campaign and he is looking forward to welcoming him to Old Trafford.